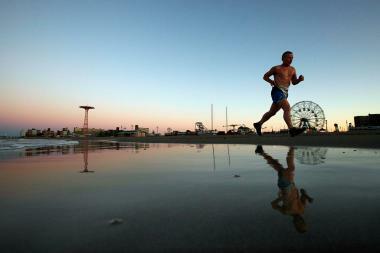 A shot of Coney Island and the amusement park at dawn. You might be stuck in the city for the weekend, but don't assume sun and sand are out of reach. These services will get you there in no time, some for just a few bucks more than a subway ride. ► To get there on the weekends, you can take the NYC Beach Bus. One-way tickets are $10, and round trips are $15. Buses leave from Williamsburg, Downtown Brooklyn and Union Square. For specific locations and times, go here. Be sure to book your tickets in advance, because buses do get sold out. ► On any of the NYC Beach Buses (which also go elsewhere on Rockaway, Jones Beach and Fire Island) you can rent rent umbrellas and chairs for $10 apiece. Deluxe chairs can be rented for $14. ► Alternatively take the Q35, the A train to the S shuttle, or the weekend ferry from Downtown Manhattan. ► The NYC Beach Bus also stops by Rockaway Beach. One-way tickets are $10 and round trips are $15. They can be purchased online. Pickup locations are the same as those for Jacob Riis Park. ► The Rockaway Beach Bus is also available to get New Yorkers directly to the beach. Pickup locations are in the Lower East Side, Williamsburg and Bushwick. One-way tickets cost $14.95 and round-trip ducats are $24.95. To book a ride go here. ► To get to Staten Island's biggest beach without a car, take the ferry to Staten Island's ferry terminal and then take the S81 or the S51. Both buses stop across the street from the beach's main entrance. ► This Pelham Bay Park location is the only public beach in The Bronx. The BxM8 and the Bx29 go there, but there's also the modified Bx12 service, which goes to the beach throughout the summer. There is no extra fee to take the summer route, so you can use your MetroCard. ► Take D, F, N, and Q to get to Coney Island. There's also the X38 and X28 express buses from Midtown Manhattan. You can also take local buses B36, B68, B74 and B82. ► To avoid public transportation and driving, beachgoers can use the Ride the City website to find a safe and speedy bike route to the beach. ► This Hempstead, Long Island, beach is relatively close to Queens and Brooklyn compared to other LI beaches. NYC Beach Bus service to Jones Beach will begin on July 9. It'll pick up passengers at Union Square and Williamsburg and takes them directly there. It's $45, either round-trip or one-way. ► The LIRR also has a train directly to the Freeport Station in Long Island. It's $20.50 from Penn Station, and $17 from Jamaica, Queens. For more information, click here.